*Disclaimer: I was given these personalized Cool Waves Easter Baskets by Personal Creations. All ideas and opinions presented here are my own. The Easter Bunny getting ready to deliver treats to boys and girls everywhere. Easter baskets will be overflowing with sugary sweets on Easter Day and at Easter Egg hunts everywhere. In case the Easter bunny is looking to put a healthy twist on this years Easter baskets I have put together a selection of treats for little ones (and adults too). 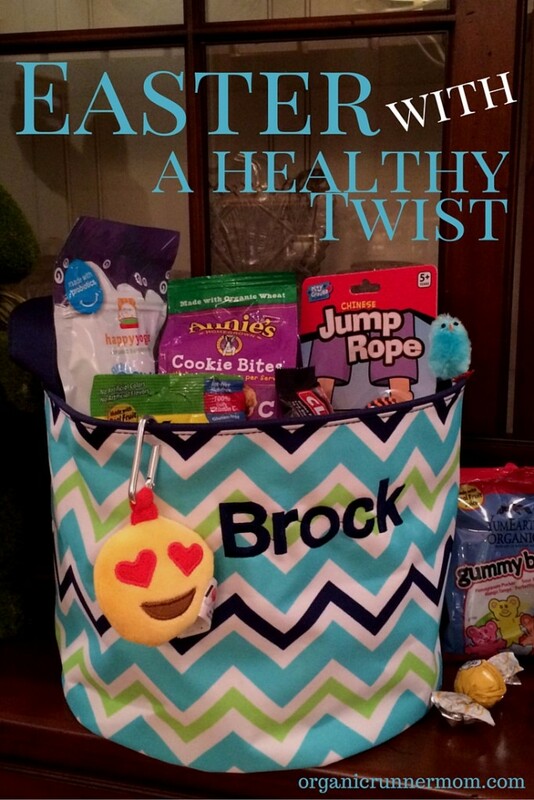 Personal Creations reached out to me as a healthy living blogger to create Easter baskets full of goodies and treats to make your little ones smile. 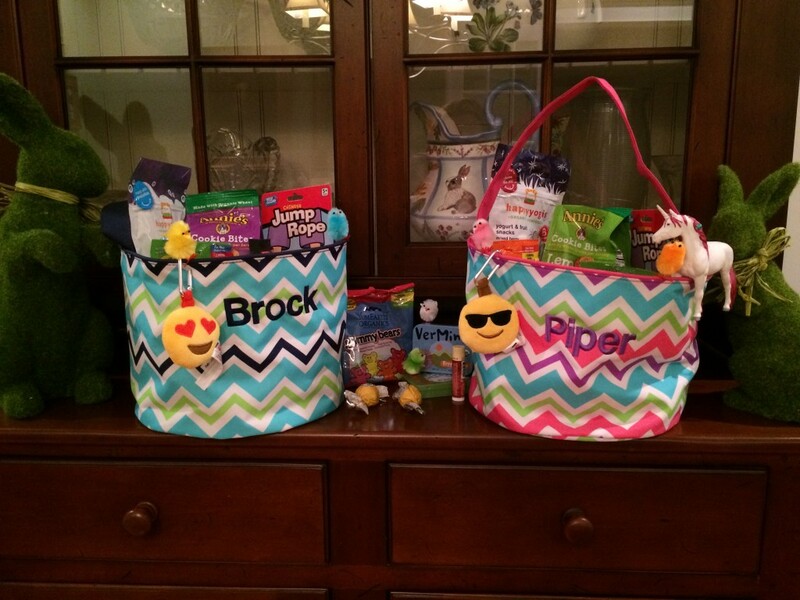 They sent me these two fun personalized COOL WAVES Easter totes for my kids to fill with a selection of healthy treats. Traditional Easter treats are often overloaded with artificial dyes and sweeteners so I have assembled baskets with mostly organic goodies and some fun playthings for your little ones to enjoy for Easter instead. 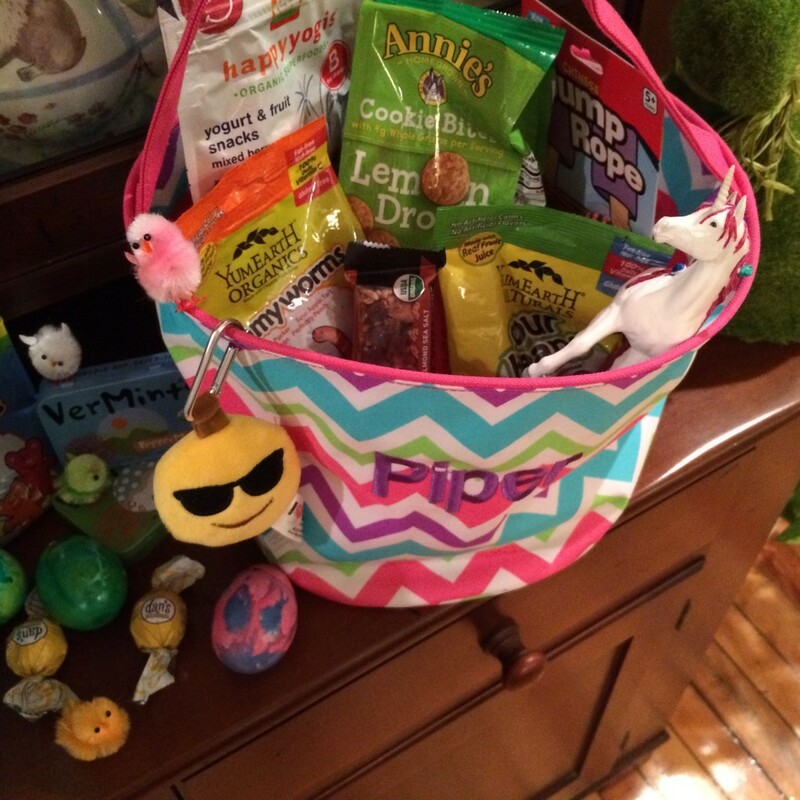 I opted to fill the basket with goodies made with organic ingredients and fewer artificial colors and flavorings. There are so many great healthy alternatives that you can choose for your little ones. 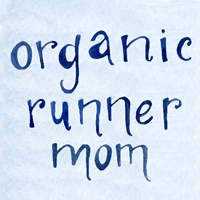 Other items that I might include would be clementines, Stonyfield organic yogurt pouches, organic applesauce pouches, creative kid crafts, homemade treats, bubbles, bubble bath, crayons, coloring books, and chalk. Easter baskets can be fun but can also be packed with treats that are at least a little bit healthier. 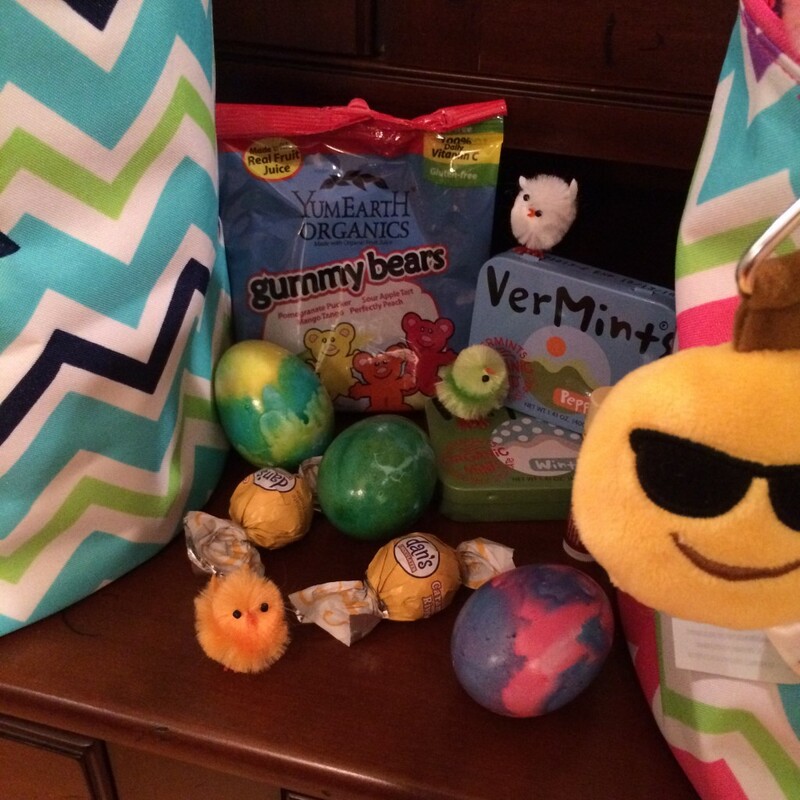 Organic Easter goodies and more . . .
My kids had fun showing me what they might like to have the Easter bunny bring. We did our Easter preparations at our local health food store, The Healthy Rhino, and our local food co-op. And of course we had to include some hardboiled eggs from our family organic egg farm! There are so many different ways to fill an Easter Basket! How healthy will your bunny be this year? What is your favorite thing that the Easter Bunny brings for your kids or that he brought when you were a kid? What would be one healthy choice that you would like to see the bunny leave for your kids this year? This is super cute! I want to try the frozen yogurt snacks! We do the organic gummies and jelly beans, but I admit, it’s not Easter without peeps. There’s a bit of a peep addiction in this house LOL. Great ideas! 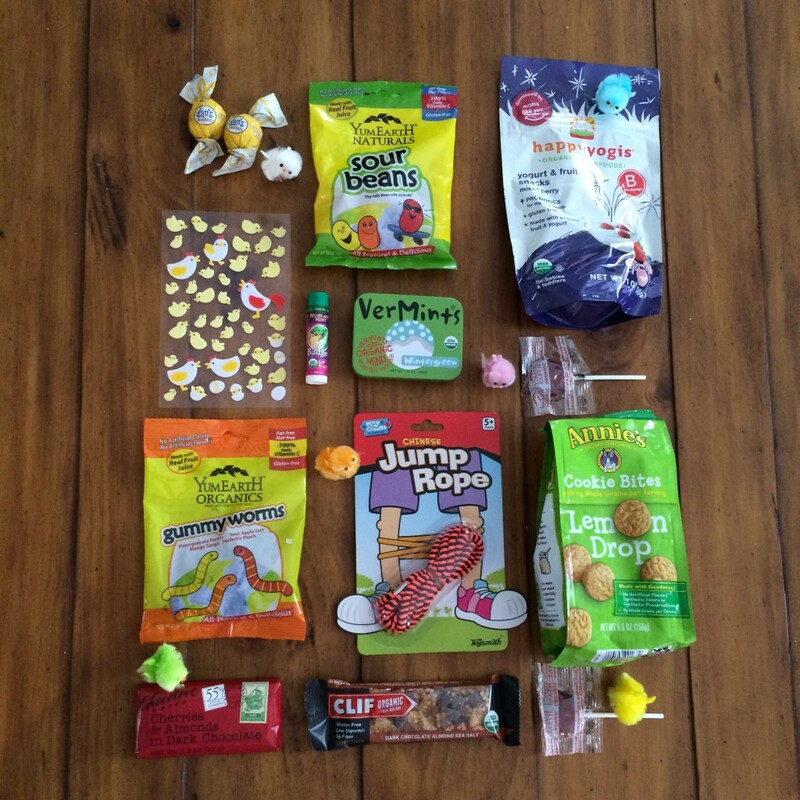 My little one is only a year so we wont’ have candy in his basket this year, but I’ll definitely have to keep in mind some of these better-for-you alternatives for future years. And those totes are so cute!